The Apache JMeter application is open source software which is used for performing load test and to measure the performance of the system. Although it was initially designed for testing Web Applications, it is now capable of performing other test functions too. The method to install Apache JMeter on Ubuntu 18.04 is covered here. Apache JMeter requires java to be pre-installed on the machine so, Before you install apache jmeter make sure you have java installed on your machine and you can verify that by using the following command. After installing java Download the latest stable version of Apache JMeter from its official site through wget command from the terminal. Connecting to www.gtlib.gatech.edu (www.gtlib.gatech.edu)|128.61.111.11|:80... connected. Now, extract the downloaded JMeter file. after extracting the apache jmeter archive, navigate to the bin directory of apache jmeter. Now run the following script to install apache jmeter. Don' t use GUI mode for load testing !, only for Test creation and Test debugging. The following screen will appear, which is apache-jmeter 4.0 . 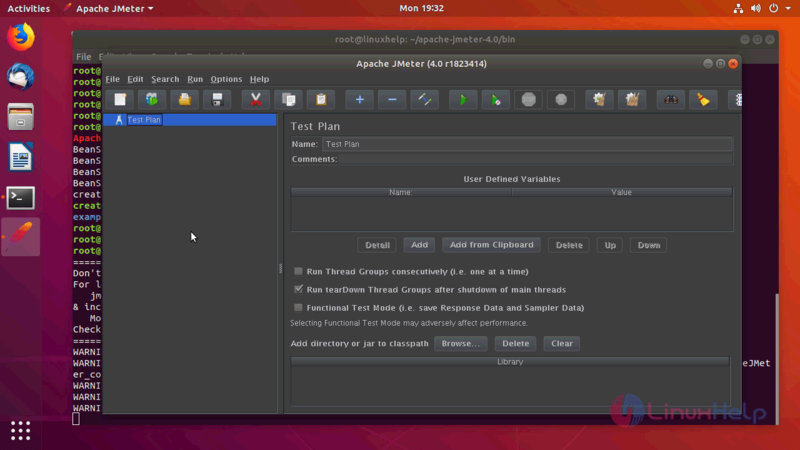 With this, the method to install apache jmeter on ubuntu 18.04 comes to an end. How to check the version of "Apache" web server on the system? You can use execute the following command on the terminal to get a version of "Apache" web server on the system. For syntax: "apache2 -V"
What is the minimum requirement to install "Apache GUI" on the system? 3. Then you can install "ApacheGUI" on your system. What is the alternative tool available for the "ApacheGUi"? What is the default Administration credential for "Apache jmeterI"?